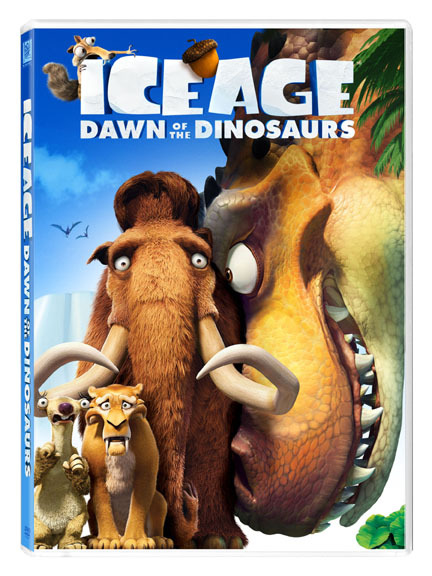 Possibly the best of all the Ice Age movies is Ice Age 3 Dawn Of The Dinosaurs. It’s time to focus on the family with the Ice Age gang as Manny and Ellie are about to give birth to their first baby mammoth. Meanwhile, Sid adopts three eggs that he finds not knowing that they are baby dinosaurs, and their mama is going to come looking for them. In this sequel, the Ice Age gang finds a world of dinosaurs previously unknown to them. With witty repartee that keeps you laughing and adventures that keep you wondering what is going to happen next, this is truly family entertainment. Though, some viewers might not appreciate some slightly crude humor. Most will appreciate the overall message that friends stick together and family does not necessarily mean that everybody looks and acts the same. “Ice Age 3: Dawn of the Dinosaurs” promotes a balanced appreciation of self and others and exhibits artistic excellence. KIDS FIRST! Child Juror Comments: Very imaginative. Funny for all ages. They went into a dinosaur land all because of Sid. You know he’s clumsy, but not that clumsy so it’s surprising. Mammoths were small compared to some of the other dinosaurs. It focused a lot more on relationships than on the element of adventure. The music was great and the animation was fantastic. I like how they came back with their baby and the baby loved the snow. Synopsis: Manny and the herd discover a lost world of ferociously funny dinosaurs, including a cranky T. rex who’s got a score to settle with Sid! Meanwhile, Scrat goes nuts over the beautiful Scratte, but is she trying to win his heart – or steal his acorn? Features hilarious performances from Ice Age veterans Ray Romano (“Everybody Loves Raymond”), John Leguizamo (The Happening), Denis Leary (“Rescue Me”), Queen Latifah (The Secret Life of Bees), Seann William Scott (Planet 51) and Josh Peck (“Drake & Josh”), along with newcomers Bill Hader (Forgetting Sarah Marshall), Kristen Wiig (“Saturday Night Live”), Jane Lynch (“Glee”) and Simon Pegg (Shaun of the Dead). What better time is there to show caring and compassion for friends? Holiday time in Wuzzleburg is great fun when you are surrounded by your best buddies. Join Wubbzy and the gang as they build snow sculptures and go sledding. But even in all the fun, as we all know, sometimes things go awry. Even during the holidays. It’s up to Wubbzy and his sidekicks, Walden and Daizy and Widget to work together to make things holiday happy. They do this by sharing with each other, reaching out to help others through kind actions and by letting others reach out to help them. Cute songs will have your little ones dancing and singing along. This DVD promotes balanced appreciation of self and others. In a manner suitable for its intended audience. KIDS FIRST! Child Juror Comments: The adventures with Wubbzy are always fun. I love how Widget always builds something even though something funny happens out of it and it ends out not working like the Snowplower 3000 when a bird pressed a button then the snowman fell. It showed that you can solve things by thinking hard and with some friends to help. It looked and sounded great. It was almost like a play even though it was animated. Someone in a play couldn’t do what they do, like bounce on a tail. DVD. 70 min. Amazon. 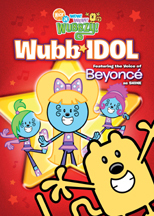 You’ve watched American Idol, now watch as our sweet little Wubbzy and his friends take on Wuzzlewood and learn about fame and adventure in Wubb Idol. This entertaining story keeps your toes tapping as singer, Beyonce, brings singing divas to life. Wubbzy and his good friends Widget and Walden go an the trip of a lifetime as they leave their home and travel across the country. They meet challenges along the way ranging from scheduling commitments to temptation and even facing their own fears. Their friendship pulls them all through and they learn that you can face anything in life with good friends at your side. “Wubb Idol” helps children work through problems and emotions issues and promotes a balanced appreciation of self and others. I stimulates curiosity and encourages children to think, reason, question and experiment. KIDS FIRST! Child Juror Comments: I loved it because it is so creative. I want to watch it again because it’s funny, an dI think my friends will love it. They treated each other nicely in the movie. When Wubbzy was in danger Walden and Widget helped him. It wasn’t really safe when Wubbzy was driving a motorcycle without a helmet, though. I liked the music and I would have sung with it, but I did not really know the songs. The movie helped me understand what I was doing sometimes with my friends when I was doing what only I wanted to do and they did not want to hang around. My favorite part was when Wubbzy was running away and whenever he tried to hide his hiding spots moved. Amazon. More Halloween DVDs – Berenstain Bears: Halloween Treats! The Berenstain Bears: Halloween Treats! This only goes to show what little (bears) can do. Halloween is an adventurous time for little cubs, and there are all sorts of things that might get scary. Join in the fun as the bears celebrate the season with bats and pumpkins and tales of ghosts. Through it all, remember that the scariness is all in fun, as the Berenstain Bear cubs know. The little ones use their bravery and know-how to debunk all the thumps in the night. Some viewers might not appreciate the way the father constantly seems uncaring and selfish and mean and ignorant. However, viewers will most likely appreciate how each episode ends with a simple, yet good moral lessons such as getting along with others and not letting your fears get a hold of you. “Halloween Treats” assists children in working through problems or emotional issues and promotes pro-activity instead of reactivity. KIDS FIRST! Child Juror Comments: Really good. All the episodes were good. The characters treated each other good except for the weasels. They were friends with all the animals. It wasn’t very scary. 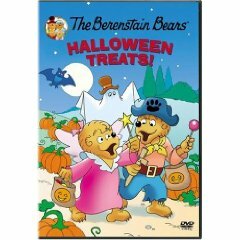 Posted in Uncategorized | Comments Off on More Halloween DVDs – Berenstain Bears: Halloween Treats! For twelve years, ARTHUR has helped children and families talk about important issues–from asthma, to dyslexia, to the death of a pet. Now, in its 13th Season, the series once again takes on a difficult topic that impacts kids and their parents in a profound way–cancer. Lance Armstrong returns to Elwood City for the two-part episode “The Great MacGrady,” about an illness that affects the lives of so many children. The special story is part of five new episodes premiering Monday, October 12 on PBS KIDS GO! (check local listings). When Lakewood Elementary’s beloved lunch lady Mrs. MacGrady is diagnosed with cancer, Arthur and his friends all react differently to the news–Arthur and D.W. rush to her side with heaps of chicken soup and stuffed animals, Muffy tries to pretend that nothing in her life has changed, and Francine is so upset she can’t even bring herself to visit Mrs. MacGrady. In this moving episode, both parents and kids learn how they can come together to support Mrs. MacGrady and each other–and Lance Armstrong makes a special appearance to show Francine and the Elwood City residents how they can take a stand, or ride a bike, for cancer survivors. “The Great MacGrady” will air every day the week of Monday, October 19. Kicking off the season, Academy Award-winning actor, Philip Seymour Hoffman lends his voice as director Will Toffman, in “No Acting Please,” a unique premiere episode about theater and the joy of the performing arts. When Fern lands a role in the Elwood City community production of “It Began With a Whistle,” she fears she’s not talented enough to be a star actress. But Will Toffman teaches Fern how to have fun, be herself and truly shine. Additional episodes premiering this fall include “Prunella and the Disappointing Ending;” Prunella and Marina are thrilled that the latest volume of the Henry Screever series, The Knights of the Boillabiasse, is finally out. The two friends immediately begin competing to see who can finish the book the fastest, but quickly learn that speed-reading doesn’t always pay off. Then, in “MacFrensky,” when Francine and Brain are locked in a stiff competition to win student of the month, Muffy talks Francine into “borrowing” Buster’s toy and letting Brain take the blame for it. As the lies grow and the prize gets closer, however, Francine’s guilt increases. Can she come clean and wash her hands of this dastardly deed? Finally, in “Brain Gets Hooked,” Brain is hooked on the latest tween reality show “Junior Island.” When he starts to ignore his friends and his schoolwork, he knows he’s got a problem. But what can he do to break the addiction? Tune-in for these episodes and more when the all-new Season of ARTHUR premieres Monday, October 12 on PBS KIDS GO! ARTHUR Adds to New “Social Networking”-Themed Activity Area Online at pbskidsgo.org/arthur! The award-winning ARTHUR Web site is home to many games and activities, including a new activity area, “The Tree House,” which launched in April 2009. Coming in October, “The Tree House” will merge with the site’s Friends section, to create a small-scale social networking space for Arthur and ALL his Pals. “The Tree House’s” goal is to demonstrate community and interconnectedness amongst the Arthur gang online, with each character hosting a page that represents their unique interests and activities related to the season’s theme. Kids can see what their favorite characters are doing to help the environment and also participate in a ‘Go Green’ Challenge. The ARTHUR Web site is also home to most of the series educational materials including resources, lesson plans, and activities and has features to help kids understand their neighbors, near and far, and gain a better appreciation for the world around them. Kids can also watch video clips and full episodes of ARTHUR at pbskidsgo.org/video. You are currently browsing the Granny Ranny's Coming Attractions weblog archives for October, 2009.